Does your husband ever consently ask you for a pen? My husband does, despite there being a pot of pens in the cupboard he always asks me for a 'normal' one, by this he actually means a ballpoint pen, give him a fibre tip or multi ink and he's not interested! 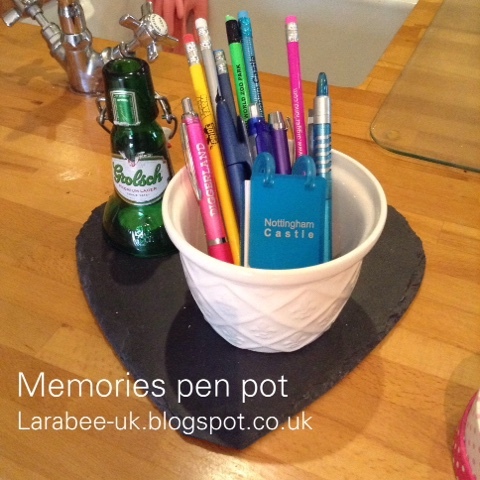 I decided that I'd put this little pot of pens and pencils together which sits on the side in our kitchen easily accessible for everyone. Now whenever we visit somewhere new we pick up a pen and a pencil and pop it in the pot. 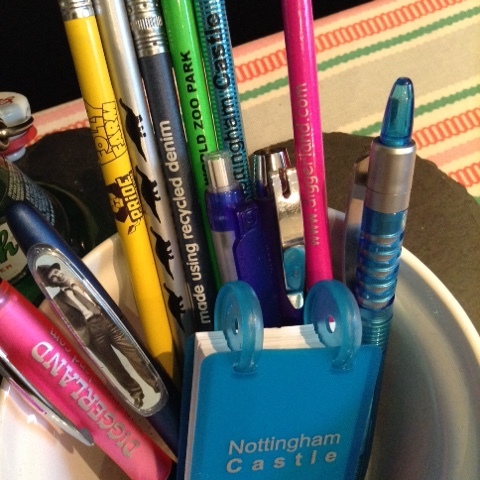 On a recent trip to Nottingham castle T wanted this little notebook, I've added that and it's been really useful, particularly for the hubs to jot down a small list of groceries if I ask him to pick some up. I'm hoping over time we'll collect lots more and as T grows older, when he takes a pen out to use he'll recall memories from each trip or location. I've also added a few in there that we already had from trips with The Teens.